Who knew that “real” maple syrup was such a big deal? I mean, I knew that it existed, but it couldn’t be much better than the stuff that Mrs. Buttersworth made, right? At least, that’s what I thought, until I got a taste of the real deal in my later teenage years. Game changer. Big time. Real maple syrup became a highly anticipated treat that came occasionally between bottles of its maple flavored substitute. My appreciation for maple syrup grew during my undergraduate career at Penn State when I was introduced to the Maple Harvest Festival my freshman year. I had a blast serving the community as many pancakes as they could fit in their stomachs accompanied by the star of the show — a rich, amber colored pure maple syrup. I listened as visitors raved about the syrup and how much better it was than the kind you got at the store. Along with the surrounding community, the Maple Harvest hiatus that occurred during Shaver’s Creek’s renovation had me longing for fresh pancakes and maple syrup. Luckily, becoming a Shaver’s Creek intern allowed me to participate in the planning of this festival’s much-awaited return. 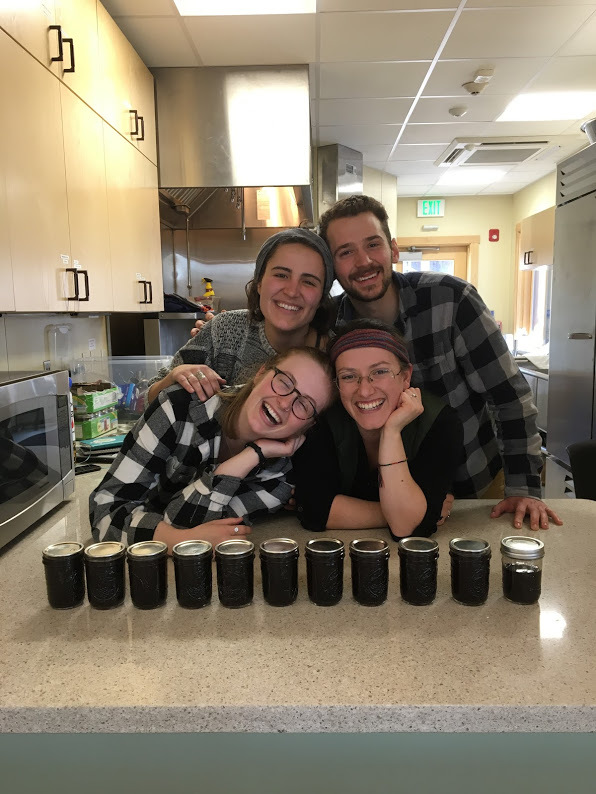 When it came time to choose intern roles for the Maple Harvest Festival, I knew that I wanted to learn more about how this sweet syrup was made. I signed up to be on the production team with my fellow interns, Bridget and Andrew, our graduate assistant, Cat, and our plant science program director, Eric. As a team, we were tasked with tapping the sugar maples surrounding Shaver’s Creek and making syrup for demonstration purposes. We started tapping early in the day. The sun was still behind the clouds and our breath fogged the air in front of us. We stomped though the snow to get to the tree, where we stood and watched Eric place the first tap of the season. He hung a bucket from the small metal spile then handed the drill to the rest of the team. We walked to the next tree and nervously pressed the drill into it, leaving a small hole. The spile was then tapped into the hole until it was snug, and we looked at each other with a little more confidence. 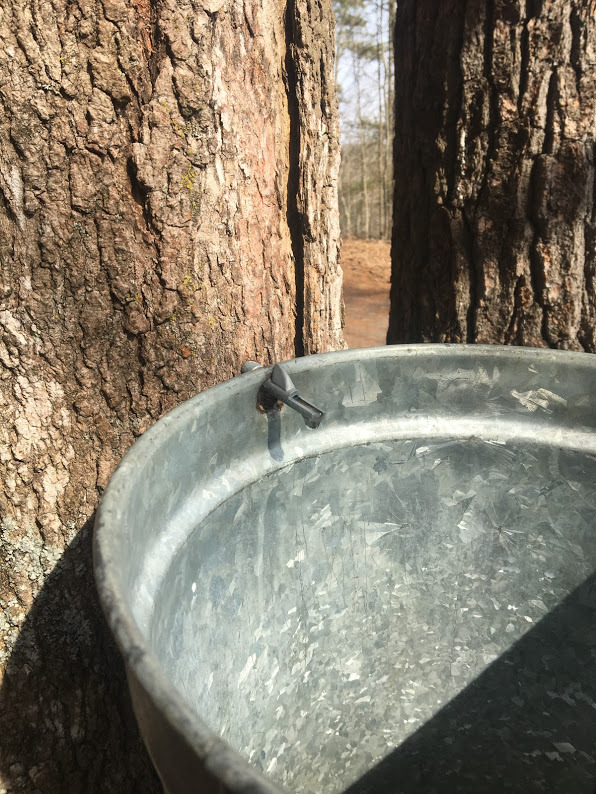 We placed tap after tap and hung buckets to collect the sap that was not yet flowing in the cold of morning…and then it happened. As the drill was pulled from the trunk of yet another sugar maple, sap immediately dripped from the hole that was left behind. Tasting that first drop of sap was a sweet experience, pun intended. We watched the sap ball up on the end of the spile before it drops directly into the mouth of the eager recipient of the first taste. It almost tastes like water… but with a hint of sweetness. The sap is only about 2% sugar, but it seemed to send us on a sugar high. Laughter and song rang through the sugar bush as we tapped the rest of the already flowing trees, tasting the first drop of each and every one. These slow and infrequent drops had excited us for what was to come. The following weeks requires us to walk to our tapped trees with large metal jugs to collect the sap that had accumulated in each of the buckets. Collected sap was stored in the Sugar Shack, where it would stay cool until it was time to boil. 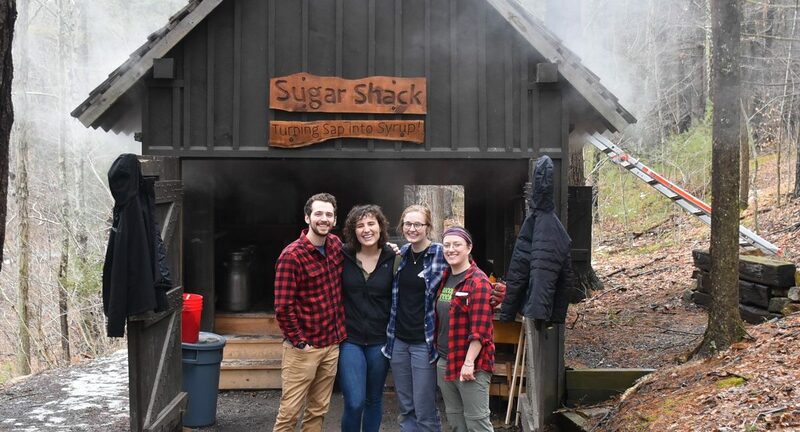 Days spent boiling at the Sugar Shack quickly became the best days of the week. Despite the fear of burning the evaporator pan and the pressure we put on ourselves to make the syrup just right, the boiling process became somewhat of a relaxing process. In between stoking the fire, refilling sap, and checking gauges, we could take a moment to enjoy the simple pleasures that came along with a day spent in the shack. We sat and listened to the creek burble by and the first songbirds of spring sing in the trees. We visited with and taught guests who wandered into the tiny building that had steam spilling from its windows. We were able to taste the fresh maple syrup—that was sap just hours before!—as we pulled it off the pan. Even though our syrup turned out a little darker than that of professional sugar makers, and it took us a month to make just less than three gallons of finished product, we are incredibly proud of the syrup we have made. We never miss an opportunity to have a staff member do a taste test of our new batches (mostly because we like hearing about how good it tastes). With the sugar season coming to a close very soon, we look forward to sharing the product of our hard work with our friends at Shaver’s Creek. To learn more about the maple sugaring experience, join us at the center this weekend, March 23 and 24, for the Maple Harvest Festival. See the sap dripping into the buckets, visit the Sugar Shack, and even try some real maple syrup on all you can eat pancakes!